Chris Forsberg drifts under a semi-truck – well, we haven’t seen him done that so far. 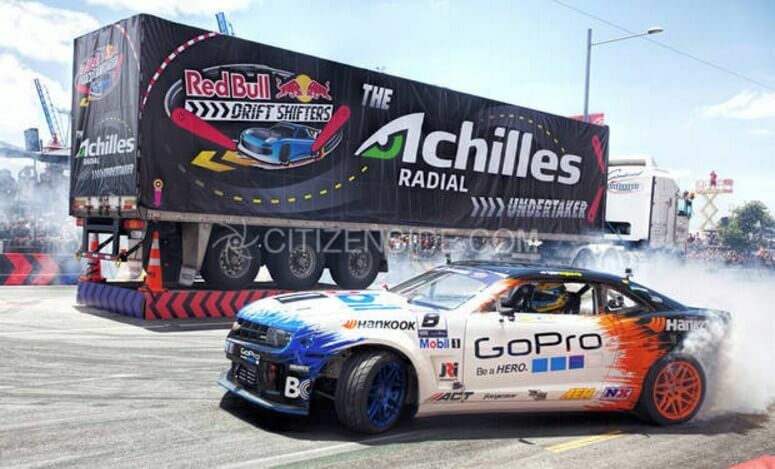 The Red Bull Drift Shifters is one of the most interesting drift events, in my opinion, and in 2014 it took place in the middle of Auckland City, in New Zealand. There, some of the biggest drift stars in the world had gathered around to show how good they can handle the wheel, along with their screaming machines. To do that, they have to go through the tight, custom course that was designed by no other than Mad Mike Whiddett. Amazing Chris Forsberg drifts! V8s and rotaries screaming all over the place, while straight sixes are barking in agony as Tuerck, Saito, Powers, Nomura and Forsberg battle it out with the New Zealand’s drivers. While they all gave out quite a performance, today we’ll be looking at something that we’ve found thrilling and that is something that Forsberg managed to do. Chris Forsberg drifts and as he was sliding around on the pinball-like course, carefully collecting points by activating proximity sensors, he turns and makes a drift under a semi-truck. The cool thing is that the video is POV so, you can actually ride shotgun as watching it. This is what people call the future of drift! Chris Forsberg drifts video below! Turbo Rocket Bunny FR-S, proudly roaming the streets! Runaway tram runs over a motorcyclist during a biker parade!